For my dear friend and mentor, NixNivis. About 2 1/2 years ago, Nix made Swords for Morgaine, a brilliant set of TSM swords converted into Body Shop accessories. I cannot praise or recommend this set enough as a storyteller's resource. The one drawback of carrying a drawn sword around in your hand all day is that eventually the city guard will start asking questions. So it's best to have a place to put the sword, so as not to injure yourself or others. So I thought it would probably be a good idea for those swords to have scabbards. 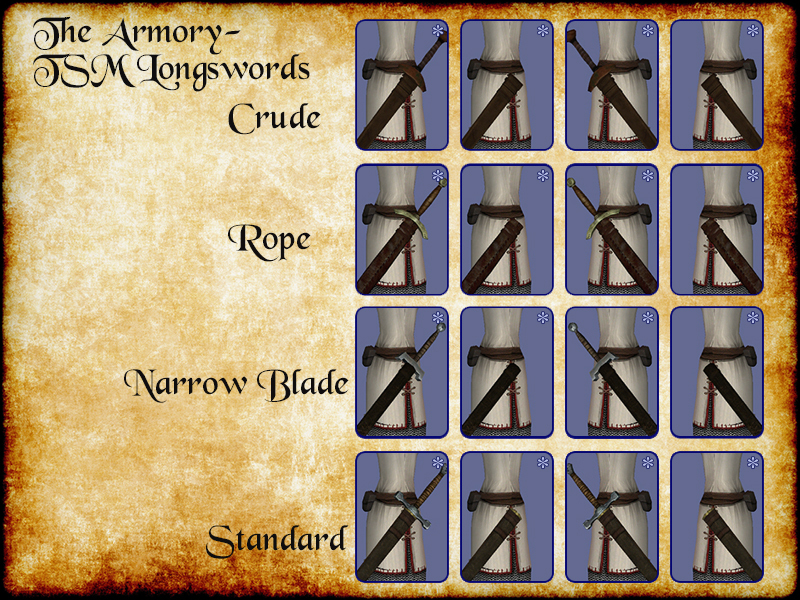 I present a completer set for Nix's original project: nine swords in eight distinct scabbards, for both genders and for teen-elder, and for both right-handers and southpaws. This is part of a much larger project I'm undertaking that will eventually include a few daggers, about 15 shields, about 10 greatswords, and a LOT of poses. I tried to rely on the original accessories as much as possible. 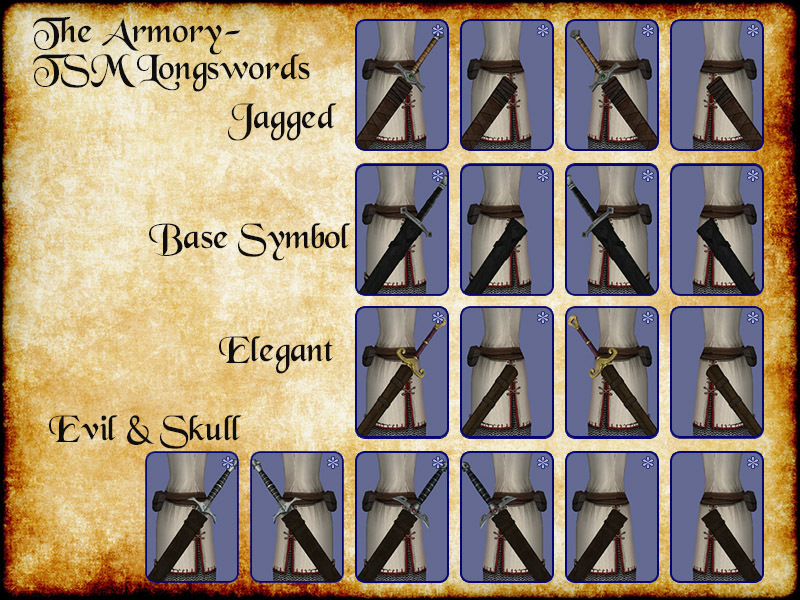 The accessories appear in the same order (That is, the scabbard on the right hip, sheathed, comes first because in the original set the sword for the left hand comes first), the clothing categories remain the same, and the accessories are binned so that they can be used with the original swords. Each sword has a unique scabbard, with the exception on the evil and skull longswords, which share a scabbard. Each sword comes with an "unsheathed" recolor so that it can be used with the drawn sword. I made custom CAS thumbnails and descriptive tooltips so that you can easily find the sword you're looking for. 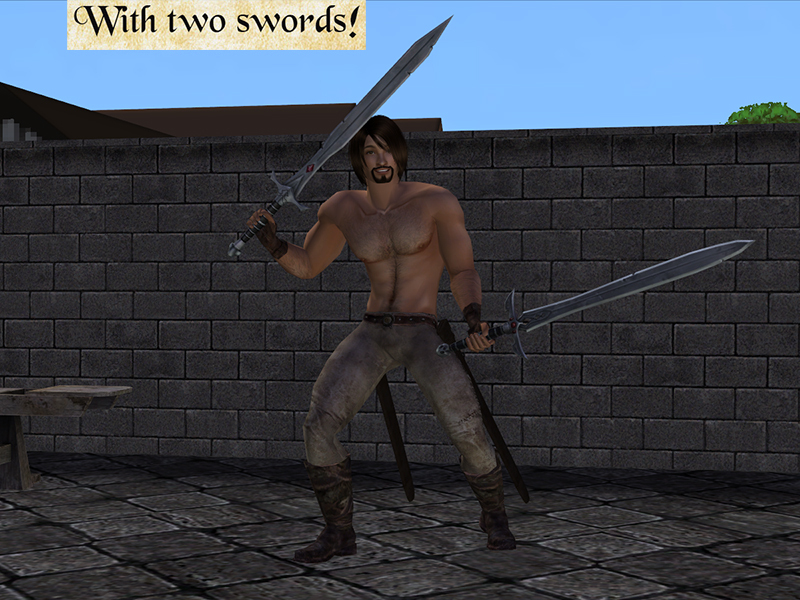 The swords are made for an "everysim"; that is to say that they're designed to fit most body types wearing tight-fitting clothes. They don't work particularly well with loose blouses, pirate shirts, belt accessories, or Rio-sized butts. Here are some pics of the original swords being used with the "unsheathed" scabbards. 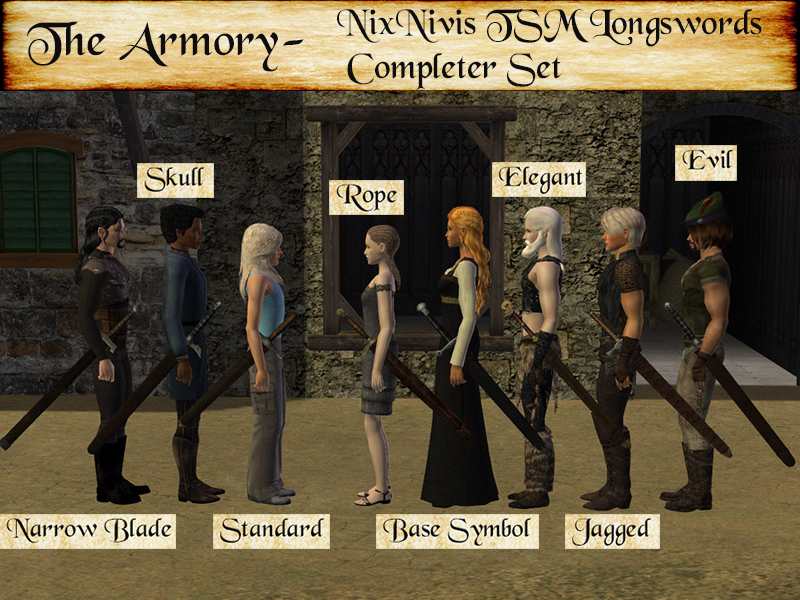 Nixnivis for converting the swords. Walx at the Oblivion Nexus for the RealSwords Nord, RealSwords Breton, RealSwords Redguard, and RealSwords Argonian sets that I extracted the scabbards from. My outfits never looked so good. Thank you for making accessories for them! Glad you like them. They look great with your outfits. Just want to say Thank You for doing this for the swords. They look great, and I appreciate the fact you shared them with the rest of us out in the net universe. Hey there. I appreciate the feedback, and I'm glad you like them. In the next 2-3 months, I'll probably be sharing the other accessory sets here and at the Keep, too. Hi, Nix! They seemed like a handy thing to have, and I'm glad to hear you'll put them to good use. I appreciate the link, and await your next story eagerly. I love your stories. You have a true gift. Aaannd as per usual, I completely forgot to check back for replies. Sorry! Are you able to kill with these swords? The swords are accessories worn on the hip. I'm eventually going to make a posebox with attacking and defending poses, and probably some dead and dying poses, too.